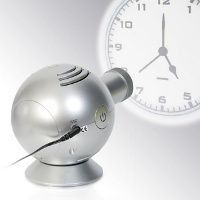 Projection clocks are nothing new, but there are new iterations from time to time – although you would not expect the technological jump to be as drastic as that of a computer or smartphone. The Karlsson Projection Clock that comes in either black or silver shades are now available for pre-order (shipping commences a couple of days later) for £69.99 each, and what can you expect out of them? Never mind about wall clocks – a clock wall is what you need, and the Karlsson Projection Clock will fill up this gap without missing a beat. This will be a mains-powered timepiece (obviously, considering the amount of juice you need to get it going) and will beam an analog clock face, alongside a sweeping second hand for that added touch of reality. Capable of working up to 8 meters away, it has an LED life of 40,000 hours. That translates to slightly more than 4 years of non-stop running – not too shabby, eh? Of course, a solitary AA battery can also be used to power this, but we would prefer to have it hooked up to the mains at all times so that you won’t inadvertently run late should the AA battery run out.